I am guessing that my first dressing experience occurred early in my elementary school years, possibly first or second grade. I don’t think it was during my time in kindergarten, although it may have been. Both of my parents worked, so I would get dropped off at my grandma’s house during school breaks including the summer vacation. There was a back bedroom, which I believe that grandma used as hers. In the bedroom there was a dresser filled with all sorts of slips and petticoats. All of them were white. Many of them were full-length slips. And this is what she wore on a daily basis under her dresses. This was circa 1962 lingerie; you get the idea of the type and quality it was. To this day, I do not know if she encouraged me to try on her slips or if I did this of my own volition. However, my first clear memory of dressing is wearing one of her white full length slips. I still remember how strange and wonderful it felt. I remember her being pleased with how I looked. And I remember being disappointed that she would not let me go outside with the slip on to play with the other neighborhood kids. Either during this first time I had her slip on or subsequent times, I distinctly remember being aroused. I will always wonder if my first arousal was due to wearing her lingerie. All I know is that this was the first time that I remember being aroused. I really don’t know if my grandma allowed or encouraged me to dress on a regular basis. As I said, I was at her house all day for summer vacations. My guess is that my slip wearing at her house was infrequent. I firmly believe that my path was established as a result of these positive and reinforcing dressing interactions with my grandma. I have a couple of full-length white slips and everytime I see them in my lingerie drawer, I have very warm feelings. 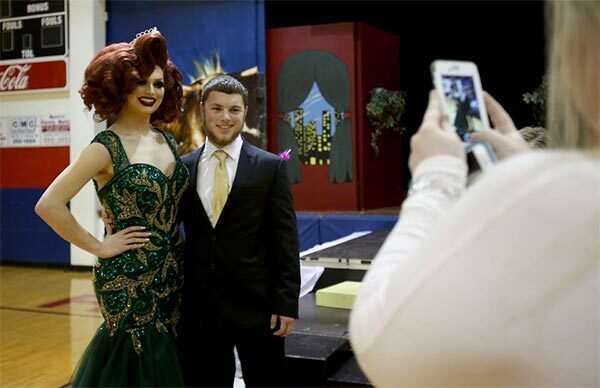 beauty pageant Trevor Ladner, poses with brother, Trenton.